Join Carol Ullmann to craft an elegant, airy wrap perfect for Michigan’s always-iffy transition to spring. 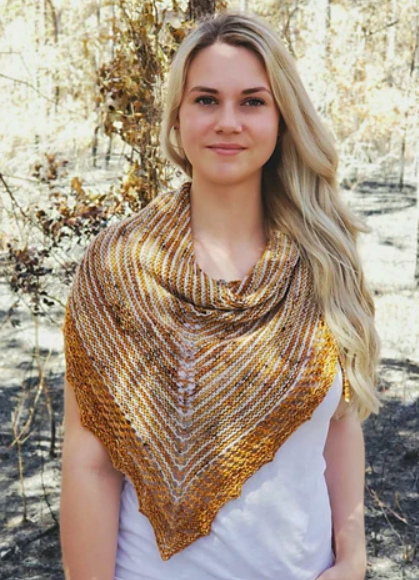 Astrid Ferrell’s “Mutti Shawl” combines plenty of relaxing garter stitch with simple shaping and a touch of elegant, straightforward lace, making it a perfect first shawl project. Work a one-color “Mutti,” mix things up by using two solid colors, or create a one-of-a-kind accessory by combining a solid color with your favorite skein of Stonehedge Fiber Mill’s Crazy. Pre-requisites: Participants should be familiar with the following: the long-tail cast-on, knitting, purling, basic increasing and decreasing, and binding off.